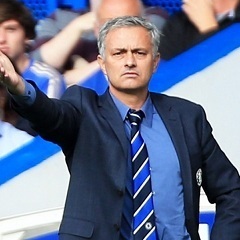 London - Jose Mourinho will select a strong Chelsea side out of respect to high-flying Championship team Derby County when they meet in the quarter-finals of the Capital One Cup on Tuesday. Only rested England defender Gary Cahill will not be considered for selection at Derby while playmaking maestro Cesc Fabregas is expected to return from the one-game suspension that saw him miss Saturday's 2-0 Premier League victory over Hull City. "We don't have problems. The players are fit, the players are not tired, the players are in good condition so no special reason not to go with a strong side," manager Mourinho told the club website (www.chelseafc.com) on Monday. "At this moment we don't speak about any other competition, we just speak about the Capital One Cup. It is a difficult opponent and we have to go with a strong side." Premier League leaders Chelsea return to the iPro Stadium where they beat Derby 2-0 in the FA Cup third round in January. John Obi Mikel and Oscar were on target that day but Mourinho said his side would not take Steve McClaren's attacking team lightly. "Derby were a strong team then and they are a strong team now," Mourinho added. "This is a cup match, a quarter-final, big motivation for them and we have to equal that motivation so our bigger talent can win." Derby, beaten in last season's playoff final, are third in the Championship, one point behind Bournemouth and Middlesbrough.